The AfrikaBurn official website located at afrikaburn.com is a copyrighted work belonging to Afrika Burn Creative Projects NPO. Certain features of the Site may be subject to additional guidelines, terms, or rules, which will be posted on the Site in connection with such features. 1.1 Subject to these Terms. AfrikaBurn grants you a non-transferable, non-exclusive, revocable, limited license to access the Site solely for your own personal, noncommercial use. 1.2 Certain Restrictions. The rights approved to you in these Terms are subject to the following restrictions: (a) you shall not sell, rent, lease, transfer, assign, distribute, host, or otherwise commercially exploit the Site; (b) you shall not change, make derivative works of, disassemble, reverse compile or reverse engineer any part of the Site; (c) you shall not access the Site in order to build a similar or competitive website; and (d) except as expressly stated herein, no part of the Site may be copied, reproduced, distributed, republished, downloaded, displayed, posted or transmitted in any form or by any means unless otherwise indicated, any future release, update, or other addition to functionality of the Site shall be subject to these Terms. All copyright and other proprietary notices on the Site must be retained on all copies thereof. AfrikaBurn reserves the right to change, suspend, or cease the Site with or without notice to you. You understand that AfrikaBurn will not be held liable to you or any third-party for any change, interruption, or termination of the Site or any part. 1.3 No Support or Maintenance. You agree that AfrikaBurn will have no obligation to provide you with any support in connection with the Site. Excluding any User Content that you may provide, you are aware that all the intellectual property rights, including copyrights, patents, trademarks, and trade secrets, in the Site and its content are owned by AfrikaBurn or AfrikaBurn’s suppliers. Note that these Terms and access to the Site do not give you any rights, title or interest in or to any intellectual property rights, except for the limited access rights expressed in the “User Content” section. AfrikaBurn and its suppliers reserve all rights not granted in these Terms. 2.1 User Content. “User Content” means any and all information and content that a user submits to the Site. You are exclusively responsible for your User Content. You bear all risks associated with use of your User Content. You hereby certify that your User Content does not violate our Acceptable Use Policy. 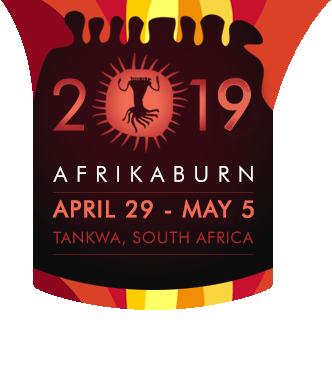 You may not represent or imply to others that your User Content is in any way provided, sponsored or endorsed by AfrikaBurn. Because you alone are responsible for your User Content, you may expose yourself to liability. AfrikaBurn is not obliged to backup any User Content that you post; also, your User Content may be deleted at any time without prior notice to you. You are solely responsible for making your own backup copies of your User Content if you desire. You hereby grant to AfrikaBurn an irreversible, nonexclusive, royalty-free and fully paid, worldwide license to reproduce, distribute, publicly display and perform, prepare derivative works of, incorporate into other works, and otherwise use your User Content, and to grant sublicenses of the foregoing rights, solely for the purposes of including your User Content in the Site. You hereby irreversibly waive any claims and assertions of moral rights or attribution with respect to your User Content. In addition, you agree not to: (i) upload, transmit, or distribute to or through the Site any software intended to damage or alter a computer system or data; (ii) send through the Site unsolicited or unauthorised advertising, promotional materials, junk mail, spam, chain letters, pyramid schemes, or any other form of duplicative or unsolicited messages; (iii) use the Site to harvest, collect, gather or assemble information or data regarding other users without their consent; (iv) interfere with, disrupt, or create an undue burden on servers or networks connected to the Site, or violate the regulations, policies or procedures of such networks; (v) attempt to gain unauthorised access to the Site, whether through password mining or any other means; (vi) harass or interfere with any other user’s use and enjoyment of the Site; or (vi) use software or automated agents or scripts to produce multiple accounts on the Site, or to generate automated searches, requests, or queries to the Site. We reserve the right to review any User Content, and to investigate and/or take appropriate action against you in our sole discretion if you violate the Acceptable Use Policy or any other provision of these Terms or otherwise create liability for us or any other person. Such action may include removing or modifying your User Content, terminating your Account in accordance with Section 5.1, and/or reporting you to law enforcement authorities. 3.1 Third-Party Links & Ads. The Site may contain links to third-party websites and services. Such Third-Party Links are not under the control of AfrikaBurn, and AfrikaBurn is not responsible for any Third-Party Links. AfrikaBurn provides access to these Third-Party Links only as a convenience to you, and does not review, approve, monitor, endorse, warrant, or make any representations with respect to Third-Party Links. You use all Third-Party Links at your own risk, and should apply a suitable level of caution and discretion in doing so. When you click on any of the Third-Party Links the applicable third party’s terms and policies apply, including the third party’s privacy and data gathering practices. 3.2 Other Users. Each Site user is solely responsible for any and all of its own User Content. Because we do not control User Content, you acknowledge and agree that we are not responsible for any User Content, whether provided by you or by others. You agree that AfrikaBurn will not be responsible for any loss or damage incurred as the result of any such interactions. If there is a dispute between you and any Site user, we are under no obligation to become involved. 3.3 Cookies and Web Beacons. Like any other website, AfrikaBurn’s Official Websites use ‘cookies’. These cookies are used to store information including visitors’ preferences, and the pages on the website that the visitor accessed or visited. The information is used to optimise the users’ experience by customising our web page content based on visitors’ browser type and/or other information. The site is provided on an “as-is” and “as available” basis, and AfrikaBurn and our suppliers expressly disclaim any and all warranties and conditions of any kind, whether express, implied, or statutory, including all warranties or conditions of merchantability, fitness for a particular purpose, title, quiet enjoyment, accuracy, or non-infringement. We and our suppliers make no guarantee that the site will meet your requirements, will be available on an uninterrupted, timely, secure, or error-free basis, or will be accurate, reliable, free of viruses or other harmful code, complete, legal, or safe. If applicable law requires any warranties with respect to the site, all such warranties are limited in duration to ninety (90) days from the date of first use. To the maximum extent permitted by law, in no event shall AfrikaBurn or our suppliers be liable to you or any third-party for any lost profits, lost data, costs of procurement of substitute products, or any indirect, consequential, exemplary, incidental, special or punitive damages arising from or relating to these terms or your use of, or incapability to use the site even if company has been advised of the possibility of such damages. Access to and use of the site is at your own discretion and risk, and you will be solely responsible for any damage to your device or computer system, or loss of data resulting therefrom. 5.1 Term and Termination. Subject to this Section, these Terms will remain in full force and effect while you use the Site. We may suspend or terminate your rights to use the Site at any time for any reason at our sole discretion, including for any use of the Site in violation of these Terms. Upon termination of your rights under these Terms, your Account and right to access and use the Site will terminate immediately. You understand that any termination of your Account may involve deletion of your User Content associated with your Account from our live databases. AfrikaBurn will not have any liability whatsoever to you for any termination of your rights under these Terms. Even after your rights under these Terms are terminated, the following provisions of these Terms will remain in effect: Sections 2 through 2.5, Section 3 and Sections 4 through 10.
a statement that the information in the notification is accurate, and under penalty of perjury, that you are either the owner of the copyright that has allegedly been infringed or that you are authorised to act on behalf of the copyright owner. 7.1 Applicability of Arbitration Agreement. All claims and disputes in connection with the Terms or the use of any product or service provided by the Company that cannot be resolved informally or in small claims court shall be resolved by binding arbitration on an individual basis under the terms of this Arbitration Agreement. Unless otherwise agreed to, all arbitration proceedings shall be held in English. This Arbitration Agreement applies to you and the Company, and to any subsidiaries, affiliates, agents, employees, predecessors in interest, successors, and assigns, as well as all authorised or unauthorised users or beneficiaries of services or goods provided under the Terms. 7.2 Notice Requirement and Informal Dispute Resolution. Before either party may seek arbitration, the party must first send to the other party a written Notice of Dispute describing the nature and basis of the claim or dispute, and the requested relief. A Notice to the Company should be sent to: 8 Junction Road, Salt River, Cape Town, 7925. After the Notice is received, you and the Company may attempt to resolve the claim or dispute informally. If you and the Company do not resolve the claim or dispute within thirty (30) days after the Notice is received, either party may begin an arbitration proceeding. The amount of any settlement offer made by any party may not be disclosed to the arbitrator until after the arbitrator has determined the amount of the award to which either party is entitled. thereto, whether directly or indirectly, the Parties must refer the dispute for resolution firstly by way of negotiation and in the event of that failing, by way of mediation and in the event of that failing, by way of Arbitration. The reference to negotiation and mediation is a precondition to the Parties having the dispute resolved by arbitration. A dispute within the meaning of this clause exists once one Party notifies the other in writing of the nature of the dispute and requires the resolution of the dispute in terms of this clause. Within 10 (ten) business days following such notification, the Parties shall seek an amicable resolution to such dispute by referring such dispute to designated representatives of each of the Parties for their negotiation and resolution of the dispute. The representatives shall be authorised to resolve the dispute. In the event of the mediation envisaged in 7.3 failing in terms of the rules of AFSA, the matter must, within 15 (fifteen) business days thereafter, be referred to arbitration as envisaged in the clauses below. 7.4 The periods for negotiation or mediation may be shortened or lengthened by written agreement between the parties. Each Party agrees that the Arbitration will be held as an expedited arbitration in Sandton in accordance with the then current rules for expedited arbitration of AFSA by 1 (one) arbitrator appointed by agreement between the Parties, including any appeal against the arbitrator’s decision. If the Parties cannot agree on the arbitrator or appeal arbitrators within a period of 10 (ten) Business Days after the referral of the dispute to arbitration, the arbitrator and appeal arbitrators shall be appointed by the Secretariat of AFSA, who shall administer and manage the arbitration proceedings. The references to AFSA shall include its successor or body nominated in writing by it in its stead. 7.5 Additional Rules for Non-Appearance Based Arbitration. If non-appearance based arbitration is elected, the arbitration shall be conducted by telephone, online and/or based solely on written submissions; the specific manner shall be chosen by the party initiating the arbitration. The arbitration shall not involve any personal appearance by the parties or witnesses unless otherwise agreed by the parties. 7.6 Time Limits. If you or the Company pursues arbitration, the arbitration action must be initiated and/or demanded within the statute of limitations and within any deadline imposed under the AFSA Rules for the pertinent claim. 7.7 Authority of Arbitrator. If arbitration is initiated, the arbitrator will decide the rights and liabilities of you and the Company, and the dispute will not be consolidated with any other matters or joined with any other cases or parties. The arbitrator shall have the authority to grant motions dispositive of all or part of any claim. The arbitrator shall have the authority to award monetary damages, and to grant any non-monetary remedy or relief available to an individual under applicable law, the AFSA Rules, and the Terms. The arbitrator shall issue a written award and statement of decision describing the essential findings and conclusions on which the award is based. The arbitrator has the same authority to award relief on an individual basis that a judge in a court of law would have. The award of the arbitrator is final and binding upon you and the Company. 7.8 Waiver of Jury Trial. THE PARTIES HEREBY WAIVE THEIR CONSTITUTIONAL AND STATUTORY RIGHTS TO GO TO COURT AND HAVE A TRIAL IN FRONT OF A JUDGE OR A JURY, instead electing that all claims and disputes shall be resolved by arbitration under this Arbitration Agreement. Arbitration procedures are typically more limited, more efficient and less expensive than rules applicable in a court and are subject to very limited review by a court. In the event any litigation should arise between you and the Company in any state court in a suit to vacate or enforce an arbitration award or otherwise, YOU AND THE COMPANY WAIVE ALL RIGHTS TO A JURY TRIAL, instead electing that the dispute be resolved by a judge. 7.9 Waiver of Class or Consolidated Actions. All claims and disputes within the scope of this arbitration agreement must be arbitrated or litigated on an individual basis and not on a class basis, and claims of more than one customer or user cannot be arbitrated or litigated jointly or consolidated with those of any other customer or user. 7.10 Confidentiality. All aspects of the arbitration proceeding shall be strictly confidential. The parties agree to maintain confidentiality unless otherwise required by law. This paragraph shall not prevent a party from submitting to a court of law any information necessary to enforce this Agreement, to enforce an arbitration award, or to seek injunctive or equitable relief. 7.11 Severability. If any part or parts of this Arbitration Agreement are found under the law to be invalid or unenforceable by a court of competent jurisdiction, then such specific part or parts shall be of no force and effect and shall be severed and the remainder of the Agreement shall continue in full force and effect. 7.12 Right to Waive. Any or all of the rights and limitations set forth in this Arbitration Agreement may be waived by the party against whom the claim is asserted. Such waiver shall not waive or affect any other portion of this Arbitration Agreement. 7.13 Survival of Agreement. This Arbitration Agreement will survive the termination of your relationship with Company. 7.14 Small Claims Court. Nonetheless the foregoing, either you or the Company may bring an individual action in small claims court. 7.15 Emergency Equitable Relief. Anyhow the foregoing, either party may seek emergency equitable relief before a state court in order to maintain the status quo pending arbitration. A request for interim measures shall not be deemed a waiver of any other rights or obligations under this Arbitration Agreement. 7.16 Claims Not Subject to Arbitration. Notwithstanding the foregoing, claims of defamation, violation of the Computer Misuse Act, and infringement or misappropriation of the other party’s patent, copyright, trademark or trade secrets shall not be subject to this Arbitration Agreement. 8. Electronic Communications. The communications between you and AfrikaBurn use electronic means, whether you use the Site or send us emails, or whether AfrikaBurn posts notices on the Site or communicates with you via email. For contractual purposes, you (a) consent to receive communications from AfrikaBurn in an electronic form; and (b) agree that all terms and conditions, agreements, notices, disclosures, and other communications that AfrikaBurn provides to you electronically satisfy any legal obligation that such communications would satisfy if it were be in a hard copy writing. 9. Entire Terms. These Terms constitute the entire agreement between you and us regarding the use of the Site. Our failure to exercise or enforce any right or provision of these Terms shall not operate as a waiver of such right or provision. The section titles in these Terms are for convenience only and have no legal or contractual effect. The word “including” means “including without limitation”. If any provision of these Terms is held to be invalid or unenforceable, the other provisions of these Terms will be unimpaired and the invalid or unenforceable provision will be deemed modified so that it is valid and enforceable to the maximum extent permitted by law. Your relationship to AfrikaBurn is that of an independent contractor, and neither party is an agent or partner of the other. These Terms, and your rights and obligations herein, may not be assigned, subcontracted, delegated, or otherwise transferred by you without AfrikaBurn’s prior written consent, and any attempted assignment, subcontract, delegation, or transfer in violation of the foregoing will be null and void. AfrikaBurn may freely assign these Terms. The terms and conditions set forth in these Terms shall be binding upon assignees. 10. Copyright/Trademark Information. Copyright ©. All rights reserved. All trademarks, logos and service marks displayed on the Site are our property or the property of other third-parties. You are not permitted to use these Marks without our prior written consent or the consent of such third party which may own the Marks.